Updated look for Smart Tweezers ST-5S; all the same functionality and features with a new lighter weight and sleeker look. 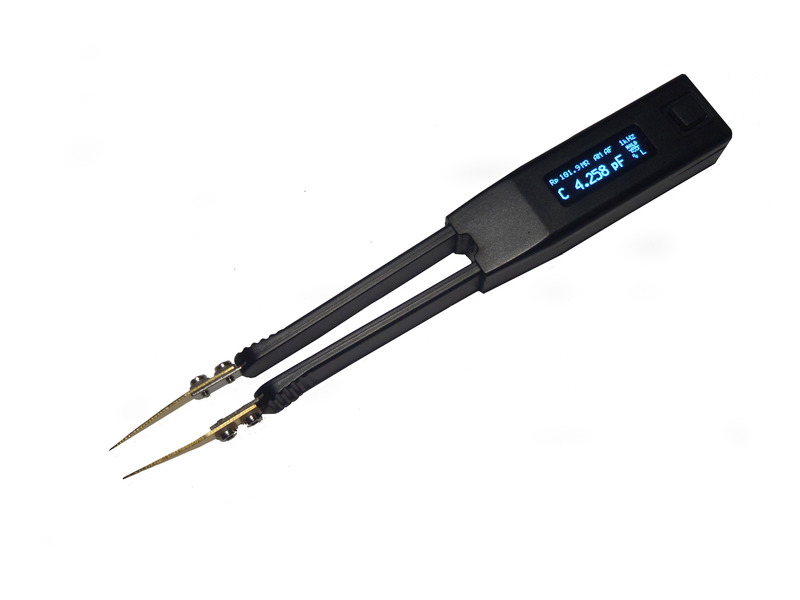 Smart Tweezers are an L-C-R meter and a set of gold-plated tweezers as the built in probes. The unique, patented mechanical and electronic design incorporates fully automatic and manual measurements with no set-up required. The efficiency and high accuracy are make an effective tool for testing and troubleshooting surface mount technology, including components on a PCB. This device is created for all applications, including manufacturing and repair as well as work on production lines. All measurement values are instantly displayed on the OLED screen. With the display's high contrast, it is easy to read even in dimly lit or unsastifactory situations. 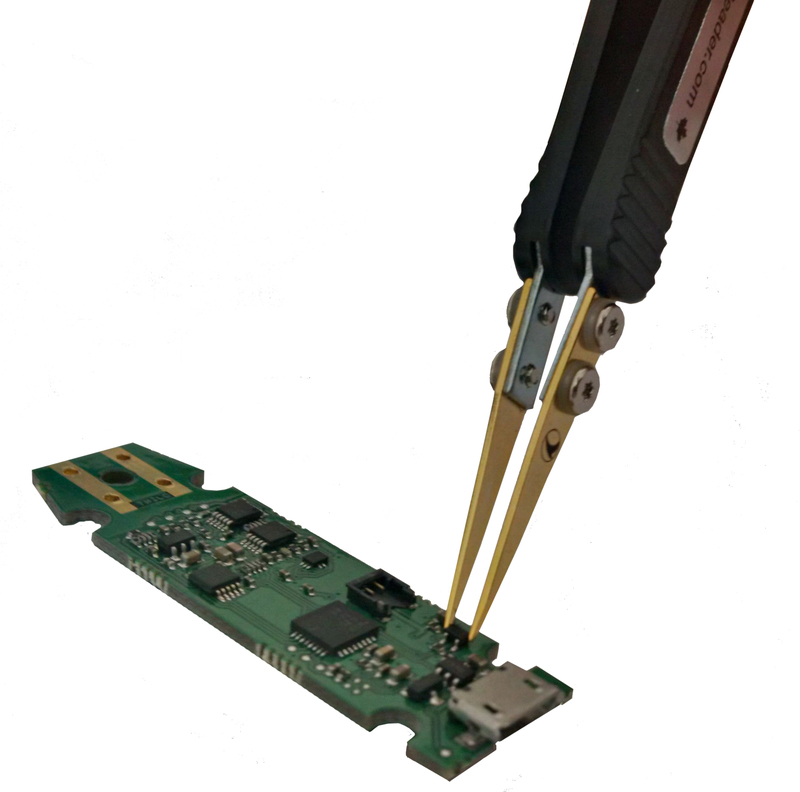 Smart Tweezers are controlled using a 4-way joystick-like navigation. Basic settings can be changed from the main screen by pressing the joystick left and right for measurment mode (AM, L, C, R), up for test signal level (10kHz, 1kHz, and 0.1 kHz), or down for high signal (0.9Vrms) or low signal (.45Vrms). 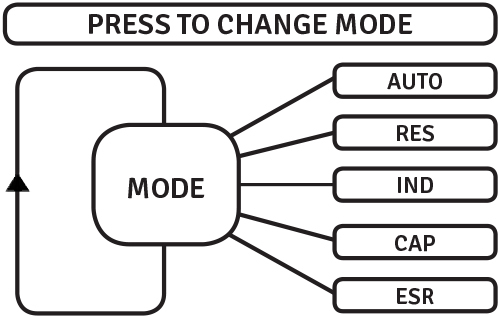 When pressing the joystick down like a button, the device will enter the extensive menus where measurement options can be customized for more specific parameters, like holds, nulls and offset subtractions, or device options can be changed, such as the orientation of the screen, display timeout, etc. 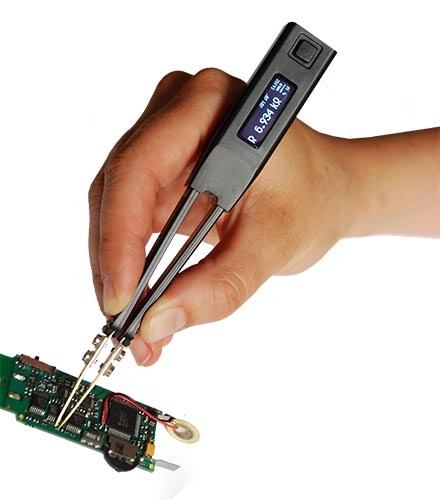 LCR-Reader is a more affordable model in the Smart Tweezers line of handheld LCR- and ESR meters. This model has the same functions as the Smart Tweezers ST-5S with less features; making it more cost-effective. 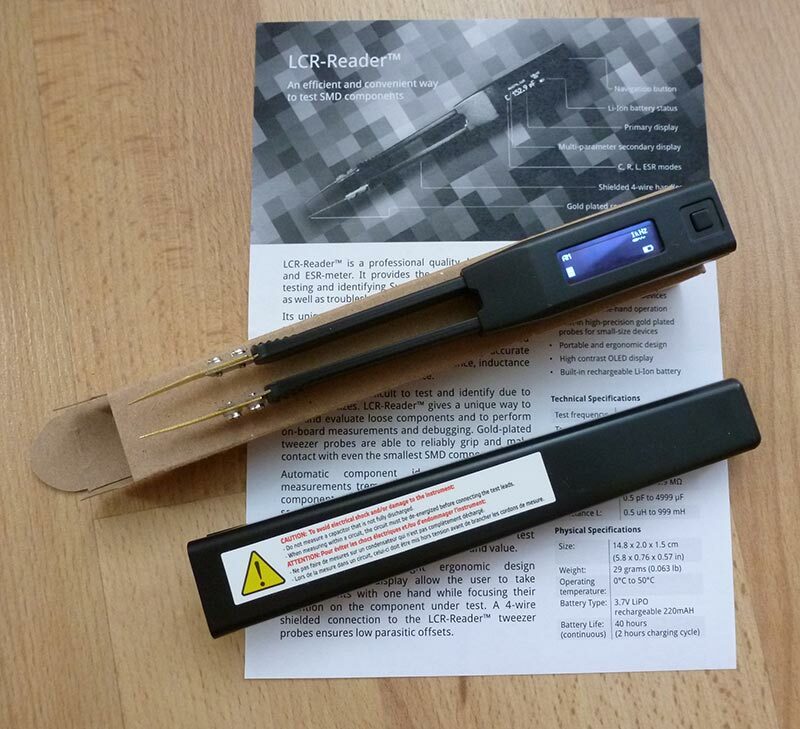 From first glance, LCR-Reader and Smart Tweezers look the same, so what's different? LCR-Reader functions the same, with fully automatic and manual L, C, R and ESR measurements. 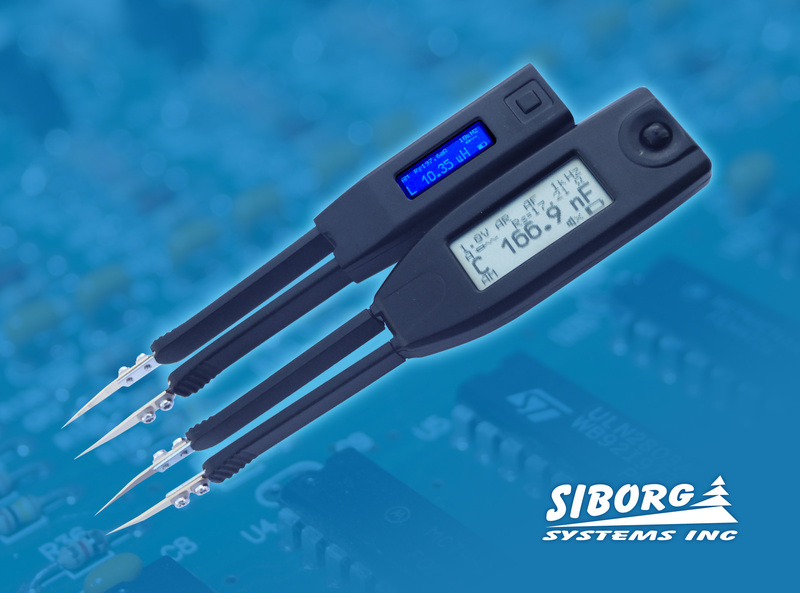 When the gold-plated tweezers have a grasp on a component, the device automatically determines the component type and best test range before measuring with a 0.5% basic accuracy. LCR-Reader was the first device in the Smart Tweezers line with the new, slimmer design with a 1 oz. weight. This new design is nearly half the size of previous Smart Tweezers model. The photo to the left shows the new design compared to the older ST-5 model. LCR-Reader has a one-button navigation that, when pressed, cycles through the measurement modes.